Roy L. Brooks reframes one of the most important, controversial, and misunderstood issues of our time in this far-reaching reassessment of the growing debate on black reparation. Atonement and Forgiveness shifts the focus of the issue from the backward-looking question of compensation for victims to a more forward-looking racial reconciliation. Offering a comprehensive discussion of the history of the black redress movement, this book puts forward a powerful new plan for repairing the damaged relationship between the federal government and black Americans in the aftermath of 240 years of slavery and another 100 years of government-sanctioned racial segregation. Key to Brooks's vision is the government's clear signal that it understands the magnitude of the atrocity it committed against an innocent people, that it takes full responsibility, and that it publicly requests forgiveness—in other words, that it apologizes. The government must make that apology believable, Brooks explains, by a tangible act that turns the rhetoric of apology into a meaningful, material reality, that is, by reparation. Apology and reparation together constitute atonement. 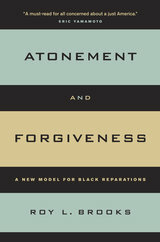 Atonement, in turn, imposes a reciprocal civic obligation on black Americans to forgive, which allows black Americans to start relinquishing racial resentment and to begin trusting the government's commitment to racial equality. Brooks's bold proposal situates the argument for reparations within a larger, international framework—namely, a post-Holocaust vision of government responsibility for genocide, slavery, apartheid, and similar acts of injustice. Atonement and Forgiveness makes a passionate, convincing case that only with this spirit of heightened morality, identity, egalitarianism, and restorative justice can genuine racial reconciliation take place in America. Roy L. Brooks is Warren Distinguished Professor of Law at the University of San Diego. He is the author of over a dozen books, including Structures of Judicial Decision Making from Legal Formalism to Critical Theory (2002), When Sorry Isn't Enough: The Controversy over Apologies and Reparations for Human Injustice (1999), Integration or Separation? A Strategy for Racial Equality (1996), and Rethinking the American Race Problem (California, 1990).